You can go back in history and find a number of trainers who have had spectacular years. D. Wayne Lukas, Todd Pletcher, and Bobby Frankel are just a few of the modern trainers who smashed the record books, saddling dozens of major stakes winners and dominating their sport like few, if any, before them. But when it comes to the greatest year ever by a trainer, the hands-down winner, in one person’s opinion, was Allen Jerkens in 1973. No, he didn’t break any records and didn’t saddle any classic winners, or even any champions. So, how could “The Chief,” as he is affectionately known, have had the greatest year ever? First, let’s establish the fact that Jerkens’ career has always existed in a different realm than other trainers. He rewrote the meaning of the word unconventional, and simply put, did things differently than anyone else. He had to, because his stable was unlike anyone else’s. It usually was made up of a ragamuffin group of misfits and castoffs, most of which were owned by his longtime friend Jack Dreyfus, who was every bit as unconventional as Jerkens. They truly were racing’s Odd Couple, but together they struck fear in every trainer and owner who sent a favorite to the post. Now in his seventh decade of training, Jerkens still is the most revered trainer in the country and idolized by those who now dominate the sport. And despite all his memorable stakes victories, he still cries openly whenever one of his horses wins a stakes, whether a minor grade III or for New York-breds. Whenever the year 1973 is discussed, Secretariat’s Triple Crown comes to mind first, followed by Big Red’s two shocking defeats at the hands of the Jerkens-trained Onion (in the Whitney) and Prove Out (in the Woodward). But to give you an idea just how special a year this was for Jerkens, consider this: When the year started, Onion had won only four-of-11 starts in allowance company; Prove Out had won only four races (a maiden and three allowance races) in 27 starts with Buddy Hirsch, finishing out of the money 17 times; Vertee had earned only $20,000 in his entire career; Poker Night had been running in $13,000 maiden claiming races; Step Nicely had broken his maiden in an $18,000 claiming race; and King’s Bishop was a solid stakes horse in the Midwest, trained by T.J. Kelly. By the end of the year, all six horses had won the equivalent of grade I stakes for Jerkens. The two defeats of Secretariat solidified Jerkens’ title as “The Giant Killer.” But there had been numerous other occasions where “David” had slain “Goliath.” In addition to defeating Secretariat at 1-10 and 3-10, Jerkens knocked off the mighty Kelso three times with Beau Purple. In those three races – the Man o’War, Suburban, and Widener – Kelso was even-money, 3-5, and 1-2, while Beau Purple paid $43.30, $12.60, and $8.70. To demonstrate just how unconventional Jerkens could be, he had taken over the training of Jack Dreyfus’ horses in 1962 and two months later found himself running against Kelso and Carry Back with a hard-headed speed horse named Beau Purple, who had been beaten 17 lengths in an overnight handicap in his most recent start. Beau Purple was an enigma in that he needed the lead, but didn’t want to be challenged. Jerkens got a feel for him by breezing him three-quarters in 1:19, a mile in 1:45, and a mile and a quarter in 2:09. He knew he had to let him roll if he was going take on Kelso and Carry Back, so he put exercise rider George Wallace on him for his next work, because Wallace liked to go fast. Six days before the Suburban, Beau Purple worked six furlongs in 1:10 flat. Two days before the Suburban, Jerkens sent Beau Purple out for a slow mile breeze, wanting to take some of the speed away. But the horse was feeling so good, he went the mile in 1:37 and galloped out 1 1/8 miles in 1:50 – two days before the Suburban. Beau Purple was gunned to the lead, with Bill Shoemaker on Kelso and John Rotz on Carry Back eyeballing each other and paying no attention to Beau Purple. When both horses closed in and moved up to Beau Purple’s flank he looked dead. Jerkens couldn’t figure out how a horse who worked in 1:10 could let horses close in on him after going in 1:12 4/5. Just then, Beau Purple kicked on and came home his final quarter in :24 flat, drawing off to a 2 1/2-length victory. His time of 2:00 3/5 established a new track record. No one knew it, but The Giant Killer had been born. In addition, Jerkens upset Buckpasser (7-10) with Handsome Boy ($12.60) in the Brooklyn Handicap; Riva Ridge (1-2) with Prove Out ($11) in the Jockey Club Gold Cup; Forego (2-1) with Step Nicely ($17.40) in the Jerome Handicap; Cicada (2-5) with Pocasaba ($21.40) in the Black Helen Handicap; Numbered Account (4-5) with Blessing Angelica ($11.80) in the Delaware Handicap; Summer Guest (4-5) and Numbered Account (9-5) with Poker Night ($11.20) in the Top Flight Handicap; Numbered Account (3-10) with Poker Night ($8) in the Bed ‘o Roses Handicap; Malicious (7-10) with Winnie ($14.20) in the Gravesend Handicap; Wajima (3-10) with Group Plan ($14.40) in the Jockey Club Gold Cup; Fanfreluche (3-5) with Taken Aback ($16.40) in the Spinster Stakes; Moccasin (2-1) with Mac’s Sparkler ($10.40) in the Columbiana Handicap; Straight Deal (6-5), with Mac’s Sparkler ($9.20) in the Black Helen Handicap; Straight Deal (7-10), Gamely (9-2), and Lady Pitt (5-1) with Mac’s Sparkler ($18.80) in the Beldame Stakes; and Temperence Hill (2-1) with Hechizado ($14.40) in the Brooklyn Handicap. And who can forget Wagon Limit’s shocking defeat of Horse of the Year Skip Away and Gentlemen at 34-1 in the Jockey Club Gold Cup. Even as recently as last year, Jerkens upset 1-5 favorite Agave Kiss with 39-1 Emma’s Encore in the grade III Victory Ride Stakes. Almost every one of the horses mentioned above that Jerkens defeated was a champion. And eight of the horses he defeated are in the Hall of Fame. Jerkens has always said there is no great secret to upsetting champions. “Great horses benefit from their reputation,” he said years ago. “Trainers are scared off and the fields usually are small with little or no competition. They win a lot of races by default. Take Secretariat for instance, if he didn’t have a nitwit like me to put two horses in against him he would have won both the Whitney and Woodward by default. No one appreciated Jerkens more than Dreyfus, who was often seen playing touch football with Jerkens and several stablehands from around the backstretch outside Jerkens’ barn. Jerkens’ competitive spirit was not confined to the racetrack. It carried over into everything he did. Just try dropping a pass thrown by Jerkens during one of those “friendly” football games. He could get aggravated with his horses when they underachieved, but he would quickly get back in their head to figure out what went wrong. That was never more evident than in 1973, when Jerkens’ horses tore up their past performances and rose to a level they had never before come close to attaining. It was like a high school football team going above and beyond their capabilities in order to please their coach. There certainly was no reason to think an allowance horse like Onion could even close to beating Secretariat. A record crowd turned out for the Whitney, and for the first time, NYRA opened the infield to the public. Only five went to the post with Secretariat the overwhelming favorite at 1-10. Although the accomplished grade I winner True Knight, owned by Darby Dan, was in the field, the crowd made Onion second choice at 5-1, demonstrating the respect they had for Jerkens. Of course, the rest, as they say, is history. To what extent Secretariat was affected by the virus he was either incubating or already was showing symptoms of, we’ll never know for sure. The bottom line is that Secretariat couldn’t catch the pacesetting Onion, making several runs at him, as a shocked nation watched in disbelief. Earlier that year, Jerkens won the Widener and John B. Campbell Handicaps with Vertee, whose sale later in the year enabled Jerkens to purchase Prove Out from King Ranch. (For the complete story of Prove Out see “The Unbeatable Horse”). One of Jerkens’ greatest training jobs that or any other year was with Poker Night, who rose from the depths of the claiming ranks to become one of the top fillies in the country, knocking off several champions along the way. After running in five claiming races for Maje Odom at 2, she was sold to Jerkens (who had carte blanche from Dryefus to buy any horse he wanted), winning a pair of allowance races early in her 3-year-old campaign. Jerkens then pulled one of his unorthodox, but brilliant moves by entering her, not only against older fillies and mares in the Bed o’ Roses Handicap, but against the great Phipps filly Numbered Account. “Most people never try running 3-year-olds against older horses early in the year,” Jerkens said years ago. “But I always try to look for opportunities with horses. If I ever had a top Kentucky Derby horse, the press would have a lot of fun with me. Instead of running in the conventional 3-year-old races, I’d run in races like the Excelsior Handicap for older horses at a mile and a quarter or the mile and a quarter Trenton Handicap at Garden State, or even the Ben Ali at Keeneland at a mile and an eighth. “I just don’t understand why people are afraid to do it when they get such a big weight allowance. I don’t buy the premise that a horse can take the heart out of another horse. I’ve had lots of horses I’ve run over their heads and they’d come right back and win. Of course, if you do it consistently you can wear them out. Poker Night not only defeated Numbered Account in the Bed ‘o Roses, she came back against older fillies and beat Numbered Account again, as well as the previous year’s Coaching Club American Oaks and Alabama winner Summer Guest, by four lengths in the Top Flight Handicap. She went on to win such top stakes as the Interborough and Hempstead Handicaps, and finished first in the Ladies Handicap, only to be disqualified, and was second in the Beldame twice. When Step Nicely was a 2-year-old, Jerkens did not exactly look at him with instant reverence. However, he had no way of knowing at the time that a tiger lurked inside that little black frame. Jerkens worked with him, and he wound up winning the Cowdin Stakes, beating Stop the Music and Linda’s Chief at odds of 16-1. He also placed in the Champagne and Garden State Stakes to Secretariat. The following year he upset Forego and Linda’s Chief in the Jerome at odds of 7-1, covering the mile in 1:34 flat. Also in the field were Our Native, winner of the Flamingo, Ohio Derby, and Monmouth Invitational; My Gallant, winner of the Blue Grass Stakes; and the Jersey Derby winner Knightly Dawn. Jerkens felt he should have finished ahead of Secretariat in the Wood Memorial. “Secretariat lugged in on him all the way down the stretch, and beat us a half-length for third,” Jerkens said. An ankle injury kept Step Nicely out for most of 1974, but he returned as a 5-year-old, winning the Roseben, Westchester, and Excelsior Handicaps. In 48 career races, Step Nicely brought back a check in 44 of them, while racing against the likes of Secretariat, Forego, Wajima, Linda’s Chief, and Stop the Music. He eventually was retired to pebble Hill Farm in Ocala. Jerkens’ last big horse in 1973 was King’s Bishop. Racing for Craig Cullinan as a 3-year-old, he won the Pontiac Grand Prix and Round Table Handicap at Arlington and the Michigan Mile and an Eighth at Detroit Racecourse. He then was sold to Mr. Richard DuPont and turned over to Jerkens. Earlier in the year, he had finished second to Key to the Mint in the Excelsior Handicap, and it was obvious he was a good horse, but Jerkens wasn’t satisfield with good. He decided to convert him into a sprinter. “He was a very fast horse, but his wind was bothering him,” Jerkens recalled. Dropping back from 1 1/4 miles in the Grey Lag Handicap, King’s Bishop set a new track record for seven furlongs at Belmont, winning the Carter Handicap by 5 1/2 lengths in a blistering 1:20 2/5, He added the Fall Highweight Handicap, defeating the speedy Shecky Greene, and was third, beaten 1 1/4 lengths, in the Met Mile. 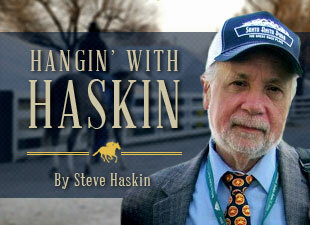 “Late in the fall he started having real bad problems with his wind and we had to retire him,” Jerkens said. King’s Bishop’s name is still remembered, thanks to NYRA naming a seven-furlong stakes after him at Saratoga that has grown to grade I status and is regarded as the most prestigious 3-year-old sprint in the country, along with the Malibu Stakes run at Santa Anita in late December. It can be said that no trainer has ever done so much with so little in a single year. Two years later, Jerkens became the youngest trainer to be inducted into the Hall of Fame. Jerkens, now 84, wins an occasional stakes, often at Saratoga, and still gets as emotional as ever. Owners nowadays seem to go for youth and big-names over experienced Hall of Fame trainers. Perhaps they are too young themselves to realize the true greatness they are passing up. In an era of instant gratification and win first time out, Jerkens’ old school methods seem to have, as Margaret Mitchell would say, gone with the wind. Jerkens, much to his dismay, will always be known as The Giant Killer, when in reality it is he who is the giant.